House and Chestnut Tree (Woodcut), a photo by randubnick on Flickr. 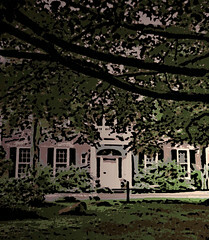 This image started with a photo that I took of the house at Long Hill Garden, here in Beverly, MA. (This is no longer a private home, but is the centerpiece of the formal gardens.) I took the original version of this photo back in May, on a sunny afternoon. Tonight I opened the image in Painter and used posterizing, lighting, and digital woodcut effects to give it a slightly scary look for October 31. October Light on Trees (Posterized Photo), a photo by randubnick on Flickr. This image began with a photo that I took last week during a late afternoon walk at Long Hill Gardens here in Beverly, MA. Today, I cropped this image from the original version and used Painter to apply some color overlay and selective posterizing. I wanted to capture the autumn trees backlit by the golden light of October. Blueberry Leaves are Red (Posterized), a photo by randubnick on Flickr. 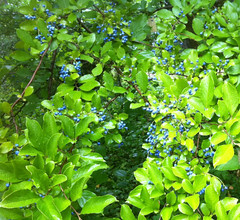 Yesterday I took some pictures of the blueberry bushes in the back yard. 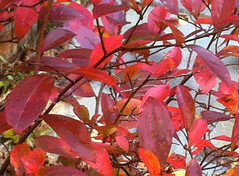 This image started with a photo of one of the bushes that has turned bright red. Tonight I opened the photo in Painter, used digital pastel to patch up some holes in the leaves. Then I applied the posterized effect, and cropped the image to get this composition. Blueberry Leaves (Posterized), a photo by randubnick on Flickr. Last night there was a dusting of snow on the blueberry bushes. By mid-morning it was gone. But there may be more snow on the way, so this afternoon, I decided that I better take pictures of these amazing leaves while it is still possible. Tonight I used Painter to crop and edit the original, using digital pastel to clean up some holes and marks in the leaves. I also simplified the background just a bit, and then posterized the image to cover my tracks. 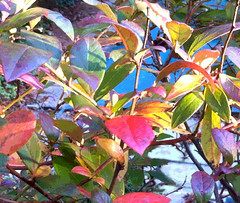 But I didn't adjust the light or the colors; the leaves really are this beautiful! Snow on Blueberry Bush, a photo by randubnick on Flickr. I was busy in the kitchen, so I didn't notice it was snowing until I looked outside around 9:30 PM. There was a light dusting of snow on the blueberry bush. I thought the leaves looked beautiful so I took some pictures with my iPhone camera. I usually have a lot of trouble shooting night photos, especially of snow, and what with reflected light in the window, I was very surprised and pleased that this worked as well as it did. Necklace with Pink Felt Bead, a photo by randubnick on Flickr. Last month, when I was visiting with my Aunt Edy in Denver, we went bead store hopping and made jewelry together. (My aunt got started making jewelry several years ago at the age of 87!). After we got back from the bead shops, my aunt showed me how to make felt beads. I posted one of the necklaces I made back on September 12, but I never got around to posting this one, which I also made the same day. For this one, I wrapped a strip of pink felt around a thick wooden skewer. Then I removed the skewer and sewed the outer end of the strip down to secure it. The next step was to sew some tiny seed beads onto the felt. I used several colors and tried to balance their placement, but really the design was pretty random because my control of the needle was not precise, to say the least. When I was finished, I put the bead on a ready-made leather choker that I had bought in one of the bead stores earlier in the day. Colorado Drawings Leadville, a photo by randubnick on Flickr. This is a small (5 x 8 inch) mixed media drawing that I did late this afternoon. This is based on the sketch I posted here yesterday, a quick pencil drawing of the mountains from an old sketchbook that I took along on a car trip in the Colorado mountains. (The sketch was labeled "To Leadville.") For this drawing, I started by copying and transferring the image into a new sketchbook with graphite paper. (I changed a few of the lines.) Then I drew back into the image with fine-line marker and conte crayon. Colorado Sketch Leadville, a photo by randubnick on Flickr. This is a another pencil sketch from the little sketchbook that I took with me on a trip to Colorado back in the 1980s. This one says "to Leadville." Today I scanned this one into the computer. Then I printed out a copy to use to make a transfer of this sketch so I can draw into it with conte crayon and fine-line marker pen. Pergola at Long Hill, a photo by randubnick on Flickr. This is another photograph that I took last Monday during a walk at Long Hill Gardens, here in Beverly, MA. 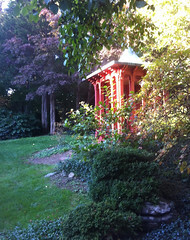 It was close to 5 PM, and the late afternoon light was shining on this little pergola. The scene looked like something out of a storybook, so I took a picture. Today I cropped the original with iPhoto to get this composition. 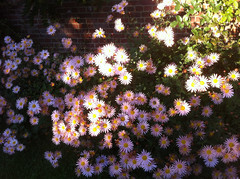 Pink Daisy Mums in Sunlight, a photo by randubnick on Flickr. 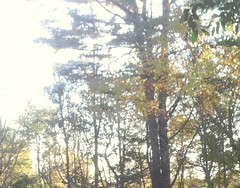 This is a photograph that I took last Monday (Oct. 17) at Long Hill Gardens here in Beverly, MA. It was nearly five P.M., and these flowers looked great in the late afternoon light, so I took a picture. This is the image just as it came out of the camera. It seemed surprising to see these flowers blooming so late in the year, but these are a kind of chrysanthemum and blooms last from late summer into the fall. I search on line and found out that these are called "Clara Curtis" chrysanthemums. Colorado Sketches Dillon Trial Run 2, a photo by randubnick on Flickr. I have been working an approach for a series of drawings based on quick pencil sketches I made back in the 1980s in a small sketchbook that I took along on a trip to Colorado. This past week, I have been creating new versions of the original sketches by transferring the images into a new sketchbook with graphite paper. Then I have been drawing back into the images with conte crayon and fine-line marker (and posting them here). Although I like the drawings well enough, I still wasn't getting to what I wanted for this series. Yesterday, while I was up at the studio at Porter Mills, I took a close look at another series of drawings I did a few years ago. (I call them transformational drawings; you can search my images for them here if you like.) Although my transformational drawings are different media (pastel and pencil over acrylic), I like the style and would like this new Colorado sketchbook series to have a similar look. So this morning I thought about all this. I decided to add vertical and horizontal lines near the borders, as in my transformational drawings. I also realized this would make it easy to add the name of the location, as I had done in some of my quick pencil sketches. All of this was adding up to starting again. Even when you love to make art, and I do, it can be discouraging to start over. But I remembered an abandoned version of the Dillon sketch that I had transferred to the new sketchbook but then rejected because of smudged graphite on the paper. I decided touse it this to try out my idea. First I erased as much of the smudge as possible. Then I put down graphite paper again and added the vertical and horizontal lines with a ruler, and wrote in the place name, "Dillon". I used fine-line marker again, but this time a lighter blue. 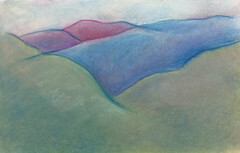 Then I added soft, pastel colors with conte crayon, using the vertical and horizontal areas as part of the composition. I was much happier with the result, and this is definitely the direction I am going to go with this series. Chicken Collage Day 9 (October 20, 2011), a photo by randubnick on Flickr. 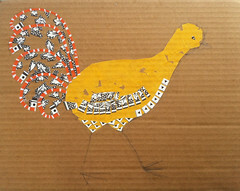 Today I went to the studio and worked on this collage for a while, a chicken made up of patterns. (This idea came to me while I was admiring the patterned feathers of some real live chickens.) Today I worked mainly on the tail feathers, pasting black and white patterns cut from recycled paper. This is like doing a jig-saw puzzle, trying to make the little pieces fit, and progress is slow. Colorado Drawings Dillon Step 3, a photo by randubnick on Flickr. 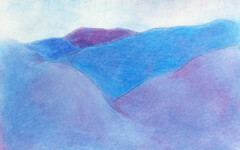 This is a small (5 x 8 inch) mixed media drawing, based on a sketch from a small sketchbook (also 5 x 8 inches) that I took along on a trip in the Colorado mountains in the 1980s. I tried to capture the lines of the mountains with quick pencil sketches, quick because I was a passenger in a moving car. The original sketch is labelled "Dillon". I want to a series of drawings based on that Colorado sketchbook, so I have been thinking hard about the choices I make as I begin. In this drawing's first stage (posted here Oct. 17), I created areas of color with conte crayon, keeping the areas of color pretty flat. I liked the color, but thought the lines were getting lost. I had been fighting the urge to draw over the conte crayon, and finally gave in and quickly drew some lines with fine line marker. (That version was posted here yesterday, October 18th.) It felt great to draw those lines in, but it also felt like I had created a problem, but I decided to try to solve it. I decided that the lines didn't seem integrated with the rest of the drawing. So I adapted the color scheme and added dark areas next to the lines. I also drew over the lines with conte crayon in some places to make the lines softer. When I was done, I was happier with the drawing. And now I have a better idea of what I want to do with the next drawing. Colorado Drawings Dillon Step 2, a photo by randubnick on Flickr. I am working on an idea for a series of drawings based on a small (5 x 8 inch) sketchbook that I took with me on a trip to Colorado back in the 80s. From the passenger seat, I used pencil to draw quick sketches, trying to capture the lines of the mountains from a moving car. Now that the sketchbook has reappeared, I want to create mixed media drawings based on the sketches, and have been trying to work out how I want them to look. 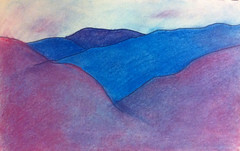 Yesterday, I worked on this drawing, using conte crayon to create flat areas of color. But I felt like the lines were disappearing, and the lines were the point of departure for this idea. I had been fighting the desire to draw back into the image with fine-line marker pen, and I succeeded in fending off the idea. . .until I gave it, just before I was ready to leave the house on an errand. (I already had my coat on.) I picked up a blue marker, and quickly traced over the lines. I took a quick picture, and left. I didn't know whether I liked the result or not. I liked the lines, but thought the image had looked better before (see yesterday's post) and so was at least a little bit horrified. But no matter what, I had the digital image of the earlier picture. I took courage from the voice of one of my favorite college painting teachers (Robert Daigle), who would urge me to try the unfamiliar approach, saying, "Good, Randi. Now you have a problem to solve." The idea that having a problem to solve leads to more creativity was a great lesson (and can be applied beyond art class). So I started to think about how to solve the problem that I had created. . . .To be continued. Colorado Drawings Dillon Step 1, a photo by randubnick on Flickr. This is a mixed media drawing (in progress), the first in what I hope will be a series of small drawings based on an old sketchbook that I used on a trip to Colorado in th 1980s. Yesterday I posted a "dress rehearsal," a trial run that I made of this sketch to see how the conte crayon and marker pen would work. Today I started "the real thing". This time I used a more constrained color scheme, and used less modeling, going for somewhat flatter areas of color. I liked the result, especially the color. I took this picture and I was going to stop here. Maybe I should have. . . .But although I thought the color was working, I felt like I was losing the lines. I had been fighting the urge to draw back into the image with fine line marker. I finally gave in. (Maybe I shouldn't have.). . .To be continued. Colorado Drawings Trial Run (Dillon), a photo by randubnick on Flickr. 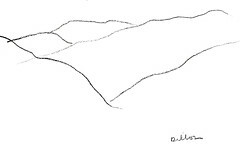 Last week I posted a line drawing of this same scene (mountains somewhere near Dillon), from a little 5 x 8 inch sketchbook that I had with me during a trip to Colorado back in the 80s. From the passenger seat, I tried to capture the lines of the mountains with quick pencil sketches. Since this old sketchbook reappeared a few weeks ago, I decided to do some small drawings based on the sketches. The image you see here is just a trial run. For each drawing, I am starting by making a new line drawing by tracing over graphite paper. This morning, I wanted to just try out my idea, mostly to find out how the conte crayon and perhaps some marker pen would work with the lines made with graphite paper. (I have already discovered that the graphite can smudge pretty badly and can't be erased.) So I made a second copy of the line drawing, just to use to experiment. I wasn't really thinking about the color scheme, just wanted to see how well the lines would show up if I used conte with various values. I also tried a little bit of marker pen, too, just in case I decide to use that. Then I got interested in the drawing and kept going, and this is the result. This little dress rehearsal was a good exercise. 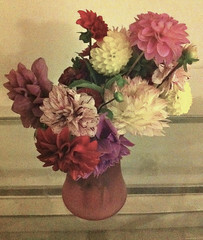 Hand Picked Bouquet (Posterized Photo), a photo by randubnick on Flickr. Yesterday I published a photo that I took of a bouquet (hand-picked at Field of Flowers at Long Hill Gardens). Tonight I used Painter to create this posterized version of the photo. I think the effect emphasizes the light. Hand Picked Bouquet, a photo by randubnick on Flickr. While I was at Long Hill Gardens yesterday to get vegetables from the Food Project (a CSA), everyone was invited to cut some flowers from "Field of Flowers," right next to the CSA's herb garden. Their flowers there are usually for sale, but because frost will come soon and there are still a lot of flowers, bouquets would be free for the taking. Even though it was raining, it sounded like fun, so I spent about ten minutes taking pictures and cutting flowers. Let me tell you that it isn't easy to do both, especially on a rainy day. But I had a good time and a nice bouquet to show for it. I took some pictures of my bouquet on Thursday night. Tonight I edited this one to get the effect I wanted, soft light and soft edges. Red Leaves in October, a photo by randubnick on Flickr. We went to Long Hill Gardens today. (Today was Thursday, pick-up day for our CSA.) 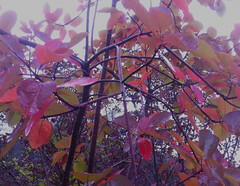 While we were there, I saw a small tree with bright red leaves growing at the edge of a field, so I took some pictures. 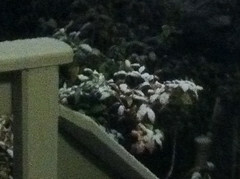 Tonight I used iPhoto to crop the original photo to get this composition. Colorado Sketchbook Dillon 1, a photo by randubnick on Flickr. This is a sketch that I made sometime in the 1980s during a summer car trip in the Colorado mountains. This sketch is one of many in a small 5 x 8 inch sketchbook. My daughter recently found the sketchbook, which had gotten mixed in with her things during our moving out and moving in to the studio that we share. Anyway, I remember using this sketchbook to try to capture the lines of the mountains as we drove along. (I guess this was one of my first forays into capturing images from a the passenger seat of a moving car, but now I use my cell phone camera!) Sometimes I wrote down approximately where we were; this one was near Dillon. I have been thinking about these little drawings and what to do about them. I like their simplicity, and the immediacy of the line. But I also want to create something more from them, and have been fighting the urge to draw into them with pastel, markers, or pencils. My idea is to make something like the transformational drawings I did a few years ago. (To see them, search for "transformational drawing" on this site.) Well, I worked out a way to both keep the original sketches just as they are, and also use them sketches for something new. The first step is scanning each original sketch into the computer, and saving it as a digital image, which is what I did with this one, and the result is the image that you see here. The next step is making a new copy of the sketch. To do that, I printed out the digital version on computer paper. Then I cropped out the 5 x 8 image, put it over a piece of graphite paper, and retraced the lines onto a new mixed media sketchbook (also 5 x 8) that I bought for this purpose. (I draw over a copy on computer paper so I don't ruin the original sketch.) So that's what I did today, and everything worked. The next step will be to draw into the "new" version of the drawing with pastels, pencils, markers. I think this is going to be fun, and a good project for my home studio, with computer and printer close by. Chicken Collage Day 8 (October 11, 2011), a photo by randubnick on Flickr. Yesterday I went to the studio at Porter Mill and worked on this project, a collage of a chicken. (A few months ago, I saw some chickens at Long Hill Gardens, was admiring the elaborate patterns in their feathers, and suddenly imagined a chicken made out of patterns, and that is how this project got started. Well, the past few weeks have been crazy, and I haven't had a chance to get back to this project. Besides, I had run out of the black and white patterned paper--cut out from the border print of an Arches watercolor pad. But yesterday, on the way to the studio, I stopped at the art supply store and picked up another Arches watercolor block in the same size. The watercolor block will be put to good use soon, but I took off the cover right away and started to cut up its black and white border.) So yesterday, with a fresh supply of black and white printed paper, I did some more work on the tail feathers. 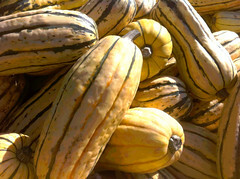 Delicata Squash (Digital Woodcut), a photo by randubnick on Flickr. Yesterday's post was a photo of delicata squash (edited and posterized in Painter). I took the original photo last Thursday at the CSA at Long Hill Gardens. I like the patterns in the squash (which is why I took the photo) and thought the image would look good as a digital woodcut. So tonight I used Painter to apply the digital woodcut effect. I fiddled with the controls to adjust the number of colors, the amount of black, etc., with the goal of emphasizing the lines and patterns in the image. Delicata Squash (Posterized), a photo by randubnick on Flickr. On Thursday afternoon, we went to the Food Project at Long Hill Gardens, here in Beverly, This is a CSA project (community supported agriculture), and every week, Thursday is the day for members to pick out, pick up, and in some cases, actually pick the vegetables for the week. It is getting late in the season, and this week there were huge carts full of pumpkins and different kinds of squash. These are delicata squash (which I know because there was a sign). I liked the patterns and colors, so I took some pictures. Tonight I cropped this image out of the original photo. Then I used Painter to clean up the squash a bit with digital pastel, and then posterized the image. I think this might look good as a digital woodcut. . . . Path in Autumn, a photo by randubnick on Flickr. Tonight I cropped this image out of a photo that I took about a week ago, on October 1st. This was during a walk at Long Hill Gardens, here in Beverly, MA. 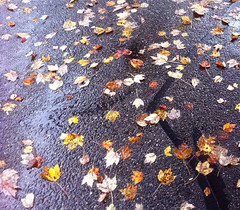 It was still raining, and there were leaves on the path from the recent storm. I liked the way the leaves looked against the dark surface of the pavement. As we walk along the path, the seasons change, leaves fall, and time passes. 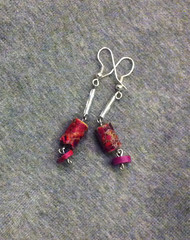 Earrings in Purple, Pink, and Silver, a photo by randubnick on Flickr. While I was visiting my aunt in Denver, we made jewelry, which is something we both love to do. We went to a couple of bead stores in Denver, and I bought some beads and put things together at my aunt's. I made these earrings to go with the necklace I made that day (seen in the photo I posted here yesterday). I forgot to write down what these beads are made of, but I think they are magnesite and dyed turquoise. 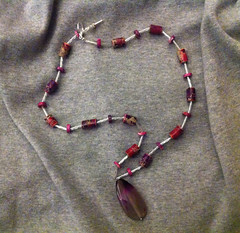 Necklace in Purple, Pink, and Silver, a photo by randubnick on Flickr. 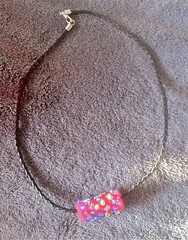 This is a necklace that I made last month when I was visiting my aunt. We went to a couple of great bead stores in Denver. Then we went back to her place and I put this together from what I had bought. My aunt helped me with the fasteners, something that is still quite a struggle for me. (She has been making jewelry for several years now, having started when she was in her eighties.) I forgot to write down what these beads are, but I think they are magnesite, dyed turquoise, twist beads, and the pendant looks like it might be agate. Anyway, I had a great time making jewelry with my Aunt Edy. I like the necklace and have already worn it several times, including to my high school reunion in Colorado, as well as to the Open Studios event at Porter Mills last week here in Beverly, MA. I have been meaning to photograph this necklace, and tonight I finally did. There are earrings, too. I plan to post a picture of them tomorrow. Three Chickens (Inspiration for Collage), a photo by randubnick on Flickr. Tonight I came across some pictures that I took at Long Hill Gardens back in early May. 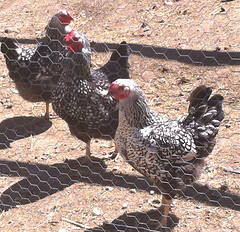 The ones that caught my eye were the photos of the chickens, covered with black and white patterns, so I cropped this image to focus on three chickens with black and white feathers. 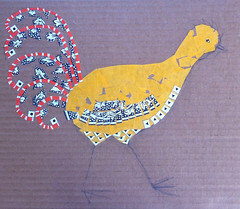 These are the chickens that inspired the collage I have been working on, a chicken made out of patterns. I haven't seen this photo in months, so I was fun to realize that some of the paper patterns I am using are really not that far from the patterns in the feathers of these chickens. It has been a crazy week, and I am eager to get back to work on my little collage. Pillar at Long Hill (Posterized Photograph), a photo by randubnick on Flickr. Tonight I used Painter to create this posterized version of the photo I published here yesterday, of a pillar at Long Hill Gardens, here in Beverly, MA. 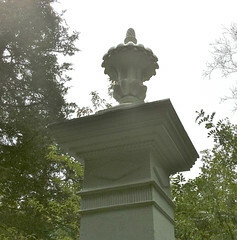 This is one of two pillars that mark the entrance to one of the gravel paths on the edges of the formal gardens. I think the pillars look mysterious, and the posterizing adds to the effect. These formal elements at Long Hill Gardens are beautiful, but somehow strange and a bit surreal in this natural setting. Seeing them sometimes makes me think of the mysterious gardens in the Alain Resnais movie of Last Year at Marienbad (the novel by Alain Robbe-Grillet). Pillar at Long Hill, a photo by randubnick on Flickr. This image started with another photograph that I took at Long Hill Gardens during a recent morning walk. The gardens are located on an old estate (Sedgwick Gardens), and the centerpiece is an old house surrounded by gardens close by, and trails further out. I like the mix of natural and formal elements. This is one of two columns at the beginning of a gravel path. Elements like this at Long Hill always make me I was looking up and admiring one of the columns, and I decided to take a picture. I was shooting into the light, so it took some editing later on (in iPhoto) to get the column to show up. I also cropped the image and used the retouch tool to get rid of a branch that was creating a distracting line. Sapphire Berries After the Rain, a photo by randubnick on Flickr. I took this photo during a morning walk at Long Hill Gardens, here in Beverly, MA. I took some pictures of sapphire berries, with drops of rain from a morning storm still on the leaves. Tonight I cropped one of my photos to get this composition. Until I moved here, I had never seen or heard of sapphire berries, with color so bright that I couldn't believe they were real.